, bishop of Worcester, was son of Mr. John Thomas, a linen-draper in the city of Bristol, who lived in a house of his own on the bridge in that town, where the bishop was born on Thursday, February 2, 1613, and | baptized there in St. Nicholas’s church, on the Friday following. He was of a very ancient and noble family, as appears by a pedigree taken out of the Heralds’ -office by William Thomas lord bishop of Worcester in 1688, to prove his right to the Herbert arms. 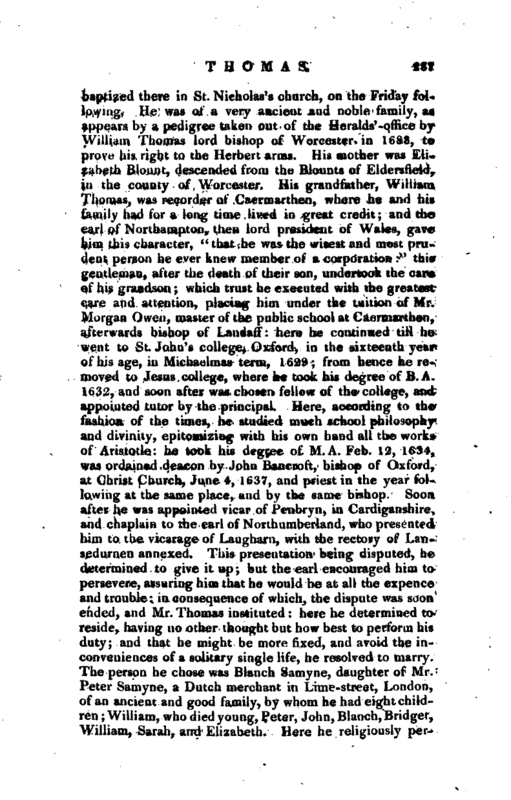 His mother was Elizabeth Blount, descended from the Blounts of Eldersfield, in the county of Worcester. 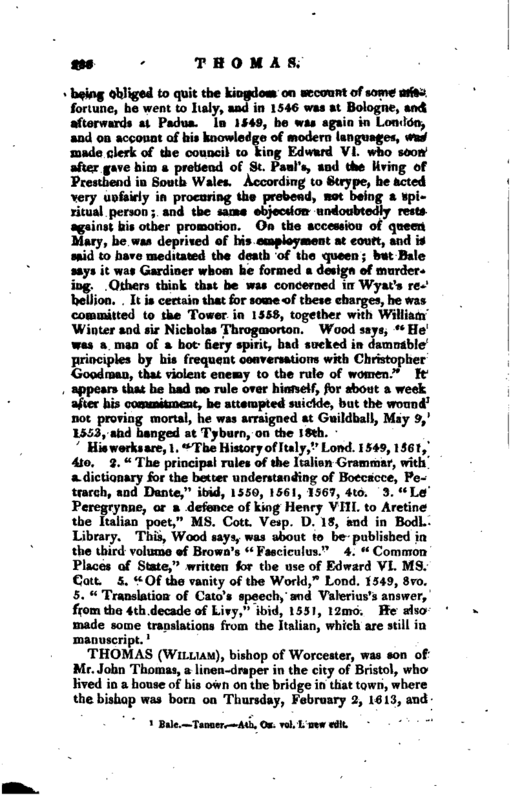 His grandfather, William Thomas, was recorder of Carmarthen, where he and his family had for a long time lived in great credit; and the earl of Northampton, then lord president of Wales, gave him this character, “that he was the wisest and most prudent person he ever knew member of a corporation:” this gentleman, after the death of their son, undertook the care of his grandson; which trust he executed with the greatest care and attention, placing him under the tuition of Mr. Morgan Owen, master of the public school at Caermarthen, afterwards bishop of Landaff: here he continued till he went to St. John’s college, Oxford, in the sixteenth year of his age, in Michaelmas term, 1629; from hence he removed to Jesus college, where he tqok his degree of B, A. 1632, and soon after was chosen fellow of the college, and appointed tutor by the principal. Here, according to the fashion of the times, he studied much school philosophy and divinity, epitomizing with his own hand all the works of Aristotle: he took his degree of M.A. Feb. 12, 1634, was ordained deacon by John Bancroft, bishop of Oxford, at Christ Church, June 4, 1637, and priest in the year following at the same place, and by the same bishop. Soon, after he was appointed vicar of Penbryn, in Cardiganshire, and chaplain to the earl of Northumberland, who presen ed him to the vicarage of Laugharn, with the rectory of Lansedurnen annexed. 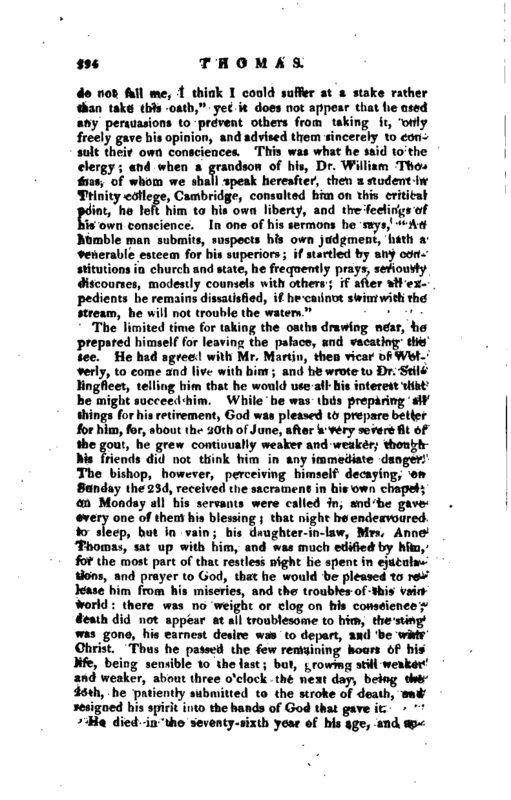 This presentation being disputed, he determined to give it up; but the earl encouraged him to persevere, assuring him that he would be at all the expence and trouble: in consequence of which, the dispute was soon ended, and Mr. Thomas instituted: here he determined to reside, having no other thought but how best to perform his duty; and that he might be more fixed, and avoid the inconveniences of a solitary single life, he resolved to marry. The person he chose was Blanch Samyne, daughter of Mr. Peter Samyne, a Dutch merchant in Lime-street, London, of an ancient and good family, by whom he had eight children; William, who died young, Peter, John, Blanch, Bridget, William, Sarah, and Elizabeth. Here he religiously | performed every duty of a parish priest, esteeming his employment not a trade, but a trust, till about 1644, a party of the parliament horse came to Langharn, and inquired whether that popish priest Mr. Thomas was still there, and whether he continued reading the liturgy, and praying for the queen; and one of them adding, that he should go to church next Sunday, and it‘ Mr. Thomas persevered in praying for that drab or the whore of Babylon, he would certainly pistol him. Upon this, Mr. Thomas’s friends earnestly pressed him to absent himself; but he refused, thinking it would be a neglect of duty. He no sooner began the service, than the soldiers came and placed themselves in the next pew to him, and when he prayed for the queen, one of them snatched the book out of his hand, and threw it at his head, saying, “What do you mean by praying for a whore and a rogue?” The preacher bore it with patience and composure; but the soldier who had committed the affront was instantly seized with such anxiety and compunction, that his companions were forced to carry him away. 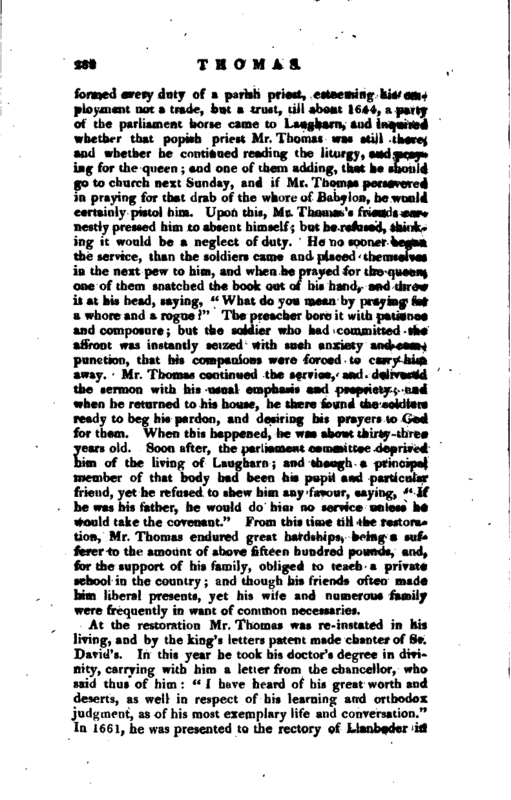 Mr. Thomas continued the service, and delivered the sermon with his usual emphasis and ’propriety; and when he returned to his house, he there found the soldiers ready to beg his pardon, and desiring his prayers to God for them. When this happened, he was about thirty-three years old. 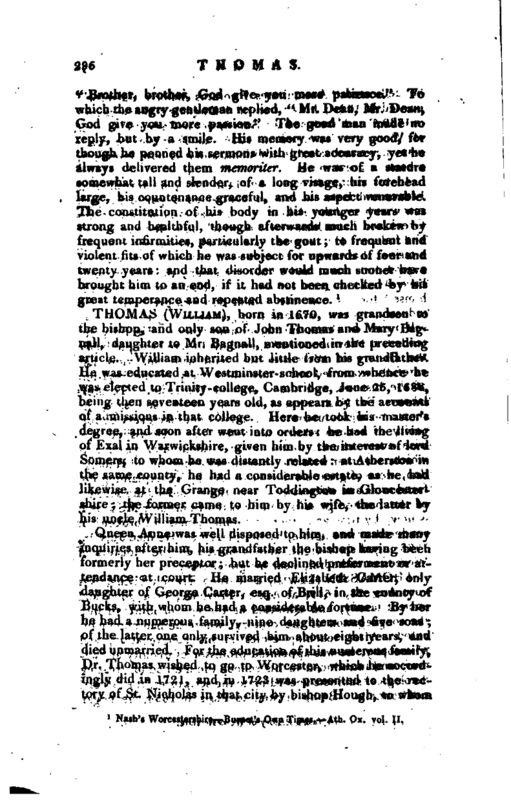 Soon after, the parliament committee deprived him of the living of Laugharn; and though a principal member of that body had been his pupil and particular friend, yet he refused to shew him any favour, saying, “If he was his father, he would do him no service unless he would take the covenant.” From this time till the restoration, Mr. Thomas endured great hardships, being a sufferer to the amount of above fifteen hundred pounds, and, for the support of his family, obliged to teach a private school in the country; and though his friends often made him liberal presents, yet his wiie and numerous family were frequently in want of common necessaries. At the restoration Mr. Thomas was re-instated in his living, and by the king’s letters patent made chanter of St, David’s. In this year he took his doctor’s degree in divinity, carrying with him a letter from the chancellor, who said thus of him: “I have heard of his great worth and deserts, as well in respect of his learning and orthodox, judgment, as of his most exemplary life and conversation.” In 1661, he was presented to the rectory of Llaqbeder in | the Vajley, in the county of Pembroke, by lord chancellor Hyde, and made chaplain to the duke of York, whom he attended in his voyage to Dunkirk, in whose family he continued some time, and with whom he was in one of the sea engagements against the Dutch. By the interest of the duke and the chancellor he was promoted to the deanery of Worcester, Nov. 25, 1665, in the room of Dr. Thomas Warrnestry, deceased. Here, though a stranger, he behaved himself in such a manner as to gain the affections of all the gentlemen of the county, particularly the duke of Beaufort, lord Windsor, afterwards created earl of Plymouth, and sir John Pakington: the last, that he might enjoy more of his company, presented him to the rectory of Hampton Lovet in the beginning of 1670. Upon this he quitted his living at Laugharn, and removed his family to Hampton. Here he enjoyed an easy and pleasant retirement, and he was often heard to say that this was the pleasantest part of his life; and that here he had more quiet and satisfaction within himself than when he was afterwards in the highest order of the church. Here also he found time to search into antiquity, to enlarge his mind, and to enrich it with fruitful knowledge: but his pleasures were not without alloy, for, during his residence here in 1677, his beloved wife died, and was buried in one of the side ailes of the cathedral church of Worcester. In this year also he was promoted to the see of St. David’s, and held the deanery of Worcester in commendam. He was very acceptable to the gentry and clergy of that diocese: he had been bred up among them, spoke their language, and had been a fellow-sufferer with many of them in the late troublesome times. His behaviour confirmed their expectations, his generous temper agreed with theirs, but his chief concern was not so much to please their humours, as to correct their morals, and save their souls; to promote true piety and goodness, and to sow the seeds of holiness among them. He began to repair the palaces at Brecknock and Aberguilly; he preached frequently in several parts of his diocese in the language of the country, and was very instrumental in promoting the translation of the Bible into Welsh. He endeavoured all he could to remove the cathedral service from St. David’s to Caermarthen; the former being a place of no trade, little frequented, situated ; in a corner of the kingdom, twelve long miles from any market town, the cathedral ruinous, the bishop’s palace | quite demolished, no residence kept, the canons never attending, except to receive their revenues, and not one shilling laid out in repairing the cathedral after the restoration. On the contrary, Caermarthen he knew to he a rich and populous town; the great church capable of heing made decent and handsome, and the episcopal house of Aberguilly very near, where the bishop constantly resided. On those motives he set about the work very heartily, but met with the same success as bishop Barlow had done before. Having been bishop of St. David’s six years, he was translated to the see of Worcester, in the place of bishop Fleetwood. 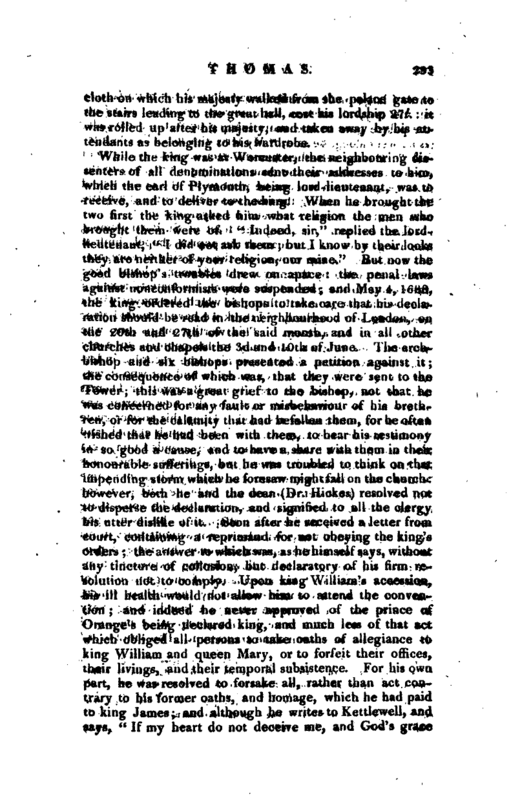 As soon as he knew of this appointment, his lordship, who never was a lover of money, desisted from any further treaty with several tenants of the bishopric of St. David’s, and refused very considerable fines, afterwards received by bishop Womack. He went to Worcester in August 1683, and was conducted to his palace by the gentry and clergy of his diocese, where they were entertained very handsomely, and ever after found a plentiful table and hearty welcome; he being always of opinion that, in order to amend the morals of the people, the first step was to gain their acquaintance and affection. Upon this principle, he was a great lover of hospitality and charity; the poor of the neighbourhood were daily fed at his door, and he sent provisions twice a week to the common prison, besides very large sums given where he saw occasion. Some may think that he carried this matter to excess for though he frequently was heard to say, “he dreaded debt as a sin,” through his extensive charity, and the necessary calls of a numerous family, he sometimes brought himself to the verge of it, he laid not up for himself or his children; and, when charged by several for not providing for his own household, his answer always was, “that no bishop or priest was to enrich himself with, or raise his family out of the revenues of the church that the sacred canons forbade it and that for his part he was resolved that none of his should be the richer for them, as he was only God’s steward, and bound to dispense them to his glory in works of charity and piety.” He was extremely careful what persons he ordained; his censures were also expressed in the softest words, and with an humble air of such tenderness and brotherly compassion as always gained the more ingenuous, and left the incorrigible without excuse. He constantly attended six o’clock prayers in the | cathedral, so long as Ins health would permit and upon complaint from archbishop Sheldon, dated June 4, 1670, that the duties of reading the church service and administering 1 the sacraments were too much neglected by dignified persons, “the cleans and canons, as if it were an office below them, and left for the most part to be performed by their vicars or petty canons, to the offence of the church’s friends, and the advantage of sectaries, and their own just reproach;” he, together with the prebendaries, so ordered the residence, that one or two of them generally officiated at the communion. 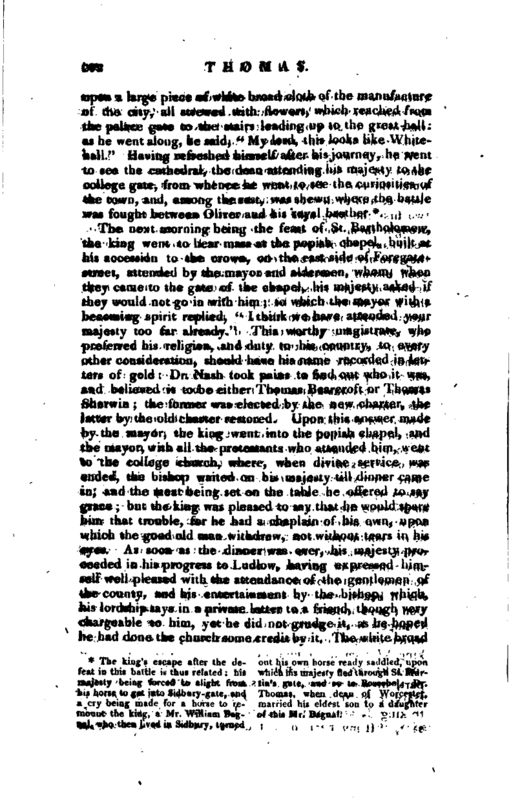 The bishop, at his first visitation of the dean and chapter, by his own authority, and their concurrence, procured a chapter act to be made, to oblige the prebendaries to be resident two at a time in every month; this being done with the concurrence of Dr. Hickes, then dean, and Dr. Hopkins, a worthy prebendary of the church, passed without the least appearance of uneasiness in any one member of the society. 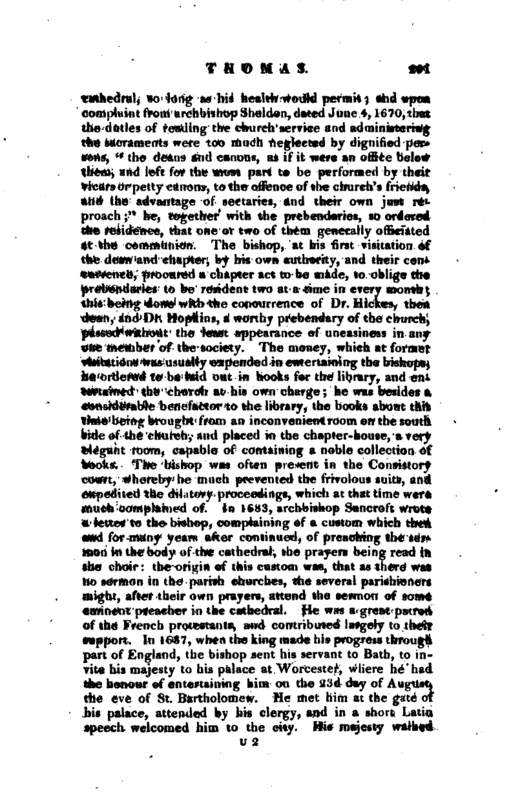 The money, which at former visitations was usually expended in entertaining, v the bishops, he ordered to be laid out in books for the library, and entertained the church at his own charge; he was besides a considerable benefactor to the library, the books about this time being brought from an inconvenient room on the south side of the church, and placed in the chapter-house, a very elegant room, capable of containing a noble collection of books. The bishop was often present in the Consistory court, whereby he much prevented the frivolous suits, and expedited the dilatory proceedings, which at that time were much complained of. Jn 1683, archbishop Bancroft wrote a letter to the bishop, complaining of a custom which then and for many years after continued, of preaching the sermon in the body of the cathedral, the prayers being read in. the choir: the origin of this custom was, that as there was no sermon in the parish churches, the several parishioners might, after their own prayers, attend the sermon of some eminent preacher in the cathedral. He was a great patron of the French protestants, and contributed largely to their support. In 1687, when the king made his progress through part of England, the bishop sent his servant to Bath, to invite his majesty to his palace at Worcester, where he had the honour of entertaining him on the 23d day of August, the eve of St. Bartholomew. He met him at the gate of his palace, attended by his clergy, and in a sfyort Latin speech welcomed him to the city. His majesty walked | upon a large piece of white broad cloth of the manufacture or the city, all strewed with flowers, which reached from the palace gute to the stairs leading up to the great hall: as he went along, he said, “My lord, this looks like Whitehall.” Having refreshed himself after his journey, he went to see the cathedral, the dean attending his majesty to the college gate, from whence he went to see the curiosities of the town, and, among the rest, was shewn where the battle was fought between Oliver and his royal brother *. * The king’s escape after the de- out his own horse ready saddled, upon feat in this battle is thus related his which his majesty fled through St. Matmajesty being forced to alight from tin’s gate, and so to Boscobrl. Dr. his horse to get into Sidbury-gate, and Thomas, when dean ef Worcester, a cry being made for a horse to re- married his eldest son to a daughter mount thfcking, a Mr. William Bag- of this Mr. Bngi.il. u* I, who then li\cd in Skibury, turned | cloth on which his majesty walked from the palace gate to the stairs leading to the great hall, cost his lordship 27/: it was rolled up after his majesty, and taken away by his attendants as belonging to his wardrobe. The limited time for taking the oaths drawing near, he prepared himself for leaving the palace, and vacating the see. He had agreed with Mr. Martin, then vicar of Wolverly, to come and live with him; and he wrote to Dr. StillinghYet, telling him that he would use all his interest that he might succeed him. While he was thus preparing all things for his retirement, God was pleased to prepare better for him, for, about the 20th of June, after a very severe fit of the gout, he grew continually weaker and weaker, though his friends did not think him in any immediate danger. 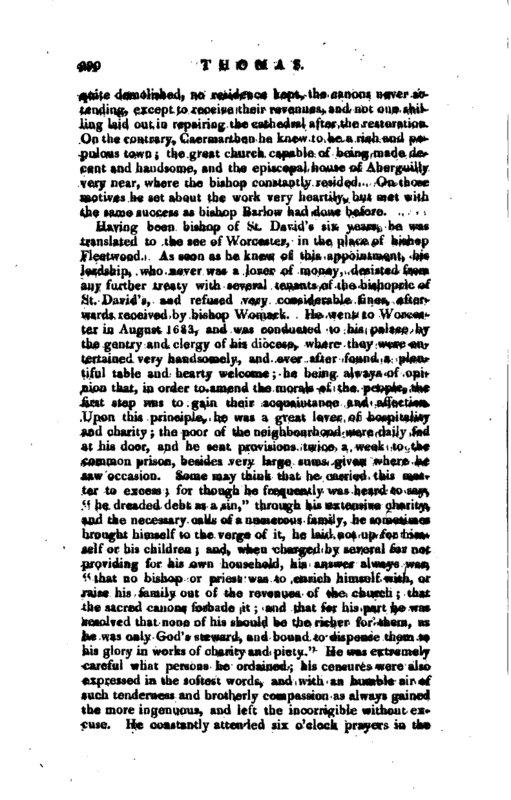 The bishop, however, perceiving himself decaying, on Sunday the2-3d, received the sacrament in his own chapel; on Monday all his servants were called in, and he gave every one of them his blessing; that night he endeavoured to sleep, but in vain; his daughter-in-law, Mrs. Anne Thomas, sat up with him, and was much edified by him, for the most part of that restless night he spent in ejaculations, and prayer to God, that he would be pleased to re* lease him from his miseries, and the troubles of this vain worl 1: there was no weight or clog on his conscience; death did not appear at all troublesome to him, the sting was gone, his earnest desire was to depart, and be with Christ. Thus he passed the few remaining hours of his life, being sensible to the last; but, growing still weaker and weaker, about three o’clock the next day, being the 25th, he patiently submitted to the stroke of death, and resigned his spirit into the hands of God that gave it. He died in the seventy-sixth year of his age, and | according to his own appointment lies buried at the north-east corner of the cloisters of Worcester cathedral, at the bottom of the steps near the south door; being used to say that the church was for the living, and not for the dead. 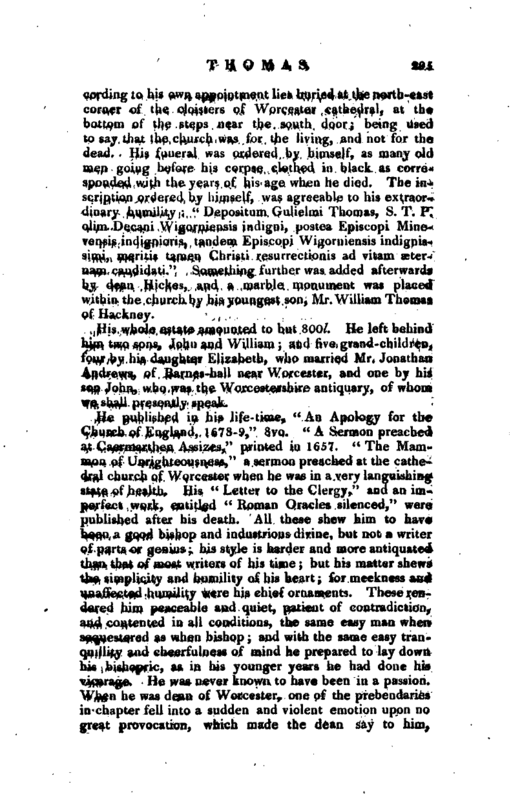 His funeral was ordered by himself, as many old men going before his corpse clothed in black as corresponded with the years of his age when he died. The inscription ordered by himself, was agreeable to his extraordinary humility: “Depositum Gulielmi Thomas, S. T. P. olim Decani Wigorniensis incligni, postea Episcopi Minevensis indignioris, tandem Episcopi Wigorniensis indignissimi, meritis tamen Christi resurrectionis ad vitam seternam candidati.” Something further was added afterwards by dean Hickes, and a marble monument was placed within the church by his youngest son, Mr. William Thomas of Hackney. His whole estate amounted to but 800l. He left behind him two sons, John and William; and five grand-children, four by his daughter Elizabeth, who married Mr. Jonathan Andrews, of Barnes-hall near Worcester, and one by his son John, who was the Worcestershire antiquary, of whom we shall presently speak. 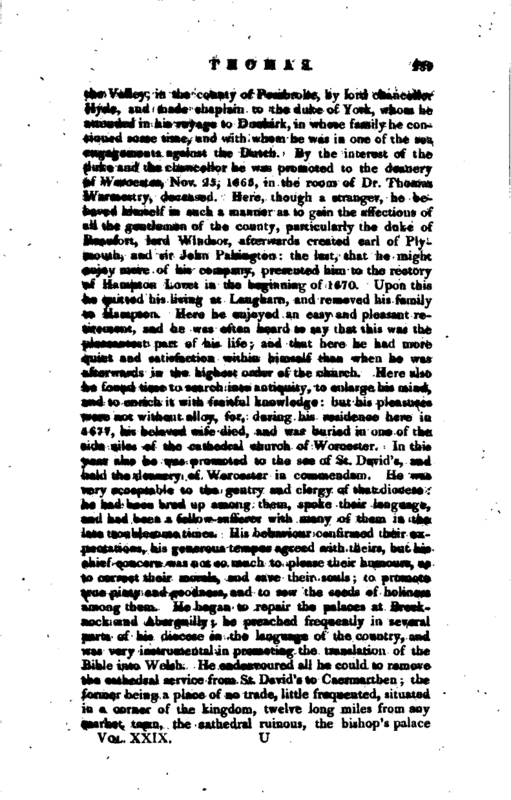 Nash’s Worcestershire—Burnet’s Own Times.—Ath. Ox. vol. II.